This page acknowledges the huge contribution that colleagues and friends made to developing the website. We thank them one and all. We have tried to acknowledge the original copyright owners of every exhibit. Most of the images are from private collections, with the majority of pictures painstakingly captured and collated by the site author, who bought much of the content from collectors around the world from his own pocket. Some items were contributed by site visitors or are of unknown origin. The site is intended for historical research. Commercial use requires a licence. If you believe you have a claim to the copyright on any of the material shown here, please contact us. The Museum was built as a hobby by a long-serving employee, and was originally published by the British store company. Work on an update was in progress when the chain collapsed unexpectedly. English Heritage requested that this work be continued so that 'a national treasure can be retained'. It was relaunched in 2010 and adapted to suit tablets and smartphones in 2017. The curator and visual designer is Paul Seaton. 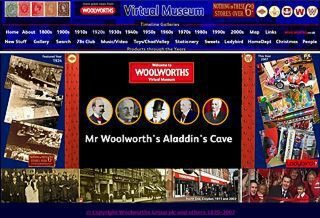 Many former British store colleagues and American Associates contributed to the site, and Paul is particularly grateful for the encouragement that he has received from ancestors of the original founders, including members of the Woolworth, Charlton, Stephenson and Denempont families. The author is very grateful to all of the contributors and would like to express his appreciation them. One of the core values of Woolworths plc was Pride in the brand. Employees proved that wasn't simply handed down from the top of the organisation but something that colleagues believed in throughout the hundred years in the High Street.